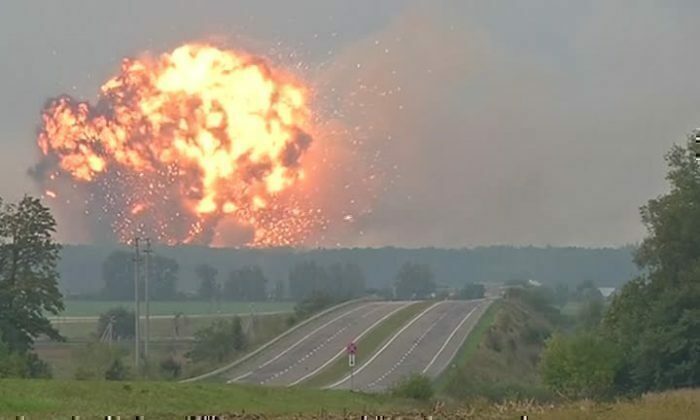 Massive explosions at an ammunition depot in central Ukraine have prompted the evacuation of more than 30,000 people and the closure of airspace over the region, the country’s emergency response agency has said. The blasts late on Sept. 26 sparked a blaze at the depot near Kalynivka in the Vinnytsya region, some 270 kilometers west of Kyiv, the September 27 statement said. Ukraine’s military prosecutor’s office said investigators were treating the explosions and fire as an act of sabotage, Ukrainian Security Service (SBU) spokeswoman Olena Hitlyanska said on September 27. National Police chief Vyacheslav Abroskin said in a statement on September 27 that hundreds of police officers from the Vinnytsya, Zhytomyr, Khmelnitskiy, Kyiv, and Chernivtsi regions were providing security and safe evacuation of people at the site. Prime Minister Volodymyr Hroysman, who arrived in Vinnytsya hours after the blast, said that “external factors” were behind the incident. Zoryan Shkiryak, an adviser to the head of the Interior Ministry, said on Facebook that he was “convinced that this is a hostile Russian sabotage,” and said it was the seventh fire at military warehouses in Kalynivka. He said a state commission of inquiry will be set up to investigate the cause of the explosions. Some 600 National Guard troops were deployed to the area to assist with the evacuation of the residents and to ensure the protection of their property from looters, the National Guard said in a statement. Some 1,200 Ukrainian firefighters were working to contain the blaze, UNIAN reported. Witnesses said that after an initial loud explosion, bright flashes were visible in the night sky. Some residents said they feared the smoke and fire from the explosion might produce toxic gases. Local media reported that the explosive wave knocked out the windows in the Kalynivka district state administration, where an emergency headquarters for teams seeking to put out the explosions and fire was later gathered. Witnesses said the sound of explosions could be heard as far away as Kyiv. Local media said that in Kalynivka, officials turned off the lights and disconnected gas and electricity supplies. Shortly after the explosions, the chief of the General Staff of the Armed Forces of Ukraine , General Viktor Muzhenko, arrived in Vinnytsya, authorities said. A volunteer of the Avtoevrozile organization of Vinnytsya, Ihor Rumyantsev, told RFE/RL that he saw about 10 buses arrive to evacuate people. He said he was helping to evacuate residents, giving priority to women and children. Early on September 27, Rumyantsev said the explosions started to increase, doubling in size, prompting people to hide in their cellars. Rumyantsev said the railway connection in the area had completely stopped. Ukrzaliznytsya reported a change in railroad routes due to the explosions. An employee of the Vinnytsya Oblast Council, Iryna Yaroshynska, confirmed the rerouting of trains going through Kalynivka. Ukraerocenter closed the airspace within a radius of 50 kilometers from the zone of explosions in the military warehouses, Ukrainian Deputy Minister of Infrastructure Yuriy Lavrenyuk said on Facebook. Residents posted video online showing what appeared to be a fire burning, lights flashing, and smoke billowing into the night sky.